The biggest re-imagining of Sky ever. Sky has just taken the wraps of Sky Q, its new premium subscription service, which will be available early next year. Sky says the new service has been driven by what its customers have been asking for, combining the power of the living room and its big screen TV, with an ecosystem which extends far beyond the boundaries of one room. "It's an ecosystem where each piece works brilliantly on its own, but also together to create a new feature we're calling fluid viewing," explained Andrew Olson, Sky's Director of Product Planning and Design. The hub of the new service is the new Sky Q set-top box, which comes with its own Apple-aping, touch-enabled, Bluetooth remote control. The new box will have a total of 12 tuners inside, giving users the option to record four shows simultaneously while watching a fifth. 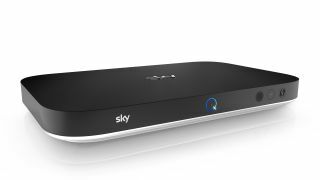 In addition to the main hub there are extra Sky Q Mini boxes, enabling you to spread the Sky goodness around the home. The Sky Q Mini is a plug-and-play wireless box enabling an extensive multi-room experience offering the exact same live channels, with up to two of the Mini devices being fed by a single Sky Q Hub box. That Sky Q Hub uses the latest Wi-Fi technologies to feed the extra boxes, but is also able to connect by sending the broadband data signals through your home's electrical wiring, in the same way Powerline home networking does. The connections don't stop there, however, as each Sky Q Hub also acts as a Wi-Fi hotspot/range extender for your home. This enables you to take your viewing away from the traditional TV experience and extend it to your mobile devices too. The new Sky Q application will turn your tablet into your own personal TV. It will deliver the exact same Sky Q experience, enabling you to stream live TV on demand and, for the first time, giving you access to the content recorded on your main Sky Q box. With this more open Sky Q ecosystem you can set up your TV recordings from any room. You can also start a download or stream from any screen, then pause and continue to watch wherever you are in your home, streaming to either connected Sky Q Mini boxes or a connected tablet. You'll also be able save recordings to your tablet, enabling you to access them via the Sky Q app away from your home too. But it's not just about the straight Sky TV packages. This is a brave new world for your Sky box, introducing a sidebar to proceedings which will enable you to access different apps on your TV. As well as applications for Vevo and YouTube, there will also be extensive musical offerings. Sky Q Music will let you stream over Bluetooth, as well as over Wi-Fi using Apple's Airplay. There was no mention though of Spotify Connect access and, as you might expect, there's unlikely to be a Netflix app anytime soon either. And what of the touted 4K Ultra HD support to bring Sky up to the same technological level as BT? Well, Sky is saying that its UHD support will be following later in 2016, along with voice search. It's an encouraging sign that the new Sky Q service will continue to grow past its initial, already extensive offerings. "Once you're up and running you're going to be ready for a stream of new features – Sky Q is going to get better and better," says Sky's Andrew Olson. We'll see the new Sky Q service going live early next year, and pricing will be announced closer to release.